A vertical ergonomic optical mouse is a good alternative for an ordinary computer mouse (especially if you’re experiencing pain in the wrist or fingers). If you are looking for one, Anker 2.4G Wireless Vertical ergonomic mouse might be the right one for you. This review should help you make the best buying decision in the end. Who Can Benefit from Anker Ergonomic Mouse? 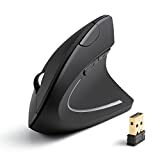 This ergonomic mouse is ideal for users who want to shift from regular mouse to a good ergonomic mouse or those who are experiencing some wrist/fingers pain already. The way you touch and hold this ergonomic mouse is significantly different from the way you use an ordinary computer mouse. Anker 2.4G has the typical right, left, and a scroll wheel. Anker 2.4G mouse is suitable for daily use considering its design and looks. The power on/off switch is on the bottom of this device, including the optical sensor and a latch for the batteries. The package doesn’t include the batteries which may disappoint some buyers. This ergonomic mouse has a great design and can be used in day to day work. It has a strong, efficient optical tracking technology which can be 800, 1200, or 1600 DPI resolution. With Anker 2.4G, you will never have a problem in putting your mouse on your right side because it has advanced tracking technology that is both precise and accurate. The mouse slides smoothly on the table even if you don’t use a mouse pad. You don’t need to use a mat or cushion because the mouse will give you enough comfort that will last longer. The scientific ergonomic style of this device ensures a normal neutral handshake arm and wrist position. It makes healthy and comfortable for anybody who should use the mouse for a long time. Gamers, designers, and programmers do not need to worry regarding overall wrist pressure due to its design. That’s because the design of this ergonomic mouse promotes consistent alignment for normal long-term use. It comes with five buttons which are easy and pain-free to press. In fact, they fit right your hand. These buttons are solid, so the clicks will never wobble. Anker 2.4G is better than other kinds of mouse that are difficult to operate. Also, the scroll wheel is quiet and even. Another feature which makes this product an excellent option is its sleek black style. It has a sturdy plastic which does not crack if you apply pressure while the applied paint is very smooth. Many wireless mice tend to be bulky, except for this one. If you are searching for an ergonomic mouse that can last longer and endure constant use, the Anker is an excellent choice. It comes with impressive power saving mode which helps prolong the battery’s life. When the mouse is not in use, it will automatically shut down on its own to save power. A user’s manual is also in the package. The instructions provided in the manual are readable and easy to follow. It will make using this ergonomic mouse much easier and enjoyable. Using this mouse is a little different experience. If it is your first time to use an ergonomic mouse, then you may take longer to learn and master using it. You may find it hard to adjust your wrist to the required position when using a mouse like this. Using the device to click something on the screen can be a problem. The best thing to do is keep on using it every day to help yourself in getting used to these changes you feel. Due to this scenario, Anker 2.4G may not be the ideal ergonomic mouse for everyone. Anker 2.4G should provide the comfort you deserve since it is the reason behind its creation. The mouse is very ergonomic and that is to relieve the strain and pressure on your wrist caused by the way you hold the mouse. At first, using it may be difficult. But you will get used to it through learning how you should hold and position your hand and arm. More tracking options – though it is not as advanced as other ergonomic optical mice, Anker provides more dpi settings which can help in fine-tuning tracking in most scenarios. Ergonomic design – the design of this mouse will fit your hand well while putting your wrist in a more nonaligned position. Flimsy buttons – the buttons do not feel solid, especially the scroll wheel and buttons. Poor tracking – the device is not as accurate as a higher-end mouse from other well-known brands. Anker 2.4G comes as a nice package. A transparent box houses the item. There is cardboard support where the mouse and its wireless adapter sit within. The box looks basic and is rather plain as it has a black and white design. Flipping the box to see its back, you will see a detailed list of the product’s features and specs. Also, there’s an illustration that points out the functions of each button you can see on this computer mouse. When you open the box, you will see the contact card which contains the manufacturer’s contact details. 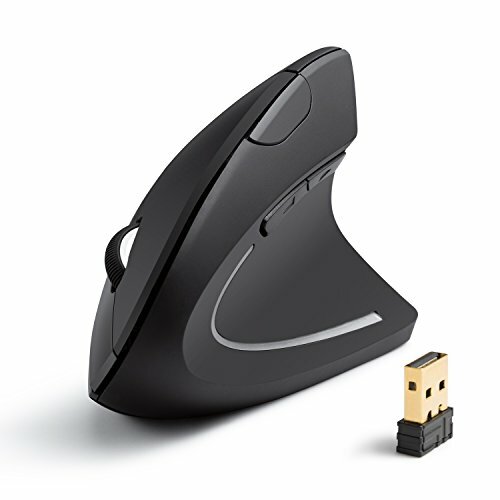 Also, there’s a wireless USB adapter that will let you connect your mouse to your PC. Anker 2.4G is a wireless device, so forget about tangling cables. Instead, the device is battery-powered, and you need to buy 2 AAA batteries for it. No matter who you are and what you do, Anker can be a good ergonomic mouse for you. This product promises to give a quick and convenient to use a mouse. Switching to a mouse like this is a good way to avoid carpal tunnel syndrome and other related health problems. Its ease of use is one thing that makes the product a good choice for every computer user whether he is a designer, programmer, or a gamer. Anker has exciting features like advanced tracking technology and its futuristic design. This ergonomic mouse is compatible with Mac OS X, Linux, Windows 7, 8, 10, XP, and 2000.